I had my eyebrows re-shaped this morning, so I thought it was the perfect opportunity to show you what eyebrow products I use on a daily basis as they have changed substantially from my previous eye makeup routine post. In the past, I never really understood why people bothered filling in their eyebrows but now, I think filling in the gaps really bring together a whole eye makeup look and I can't leave the house without at least one product on them! 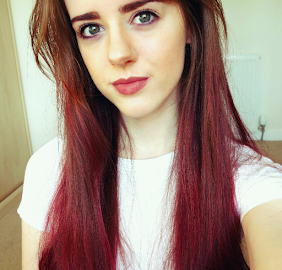 My eyebrows are far from perfect (eyebrows are sisters, not twins!) but some products I've incorporated into my makeup routine help make them look bolder and less sparse than they are naturally. 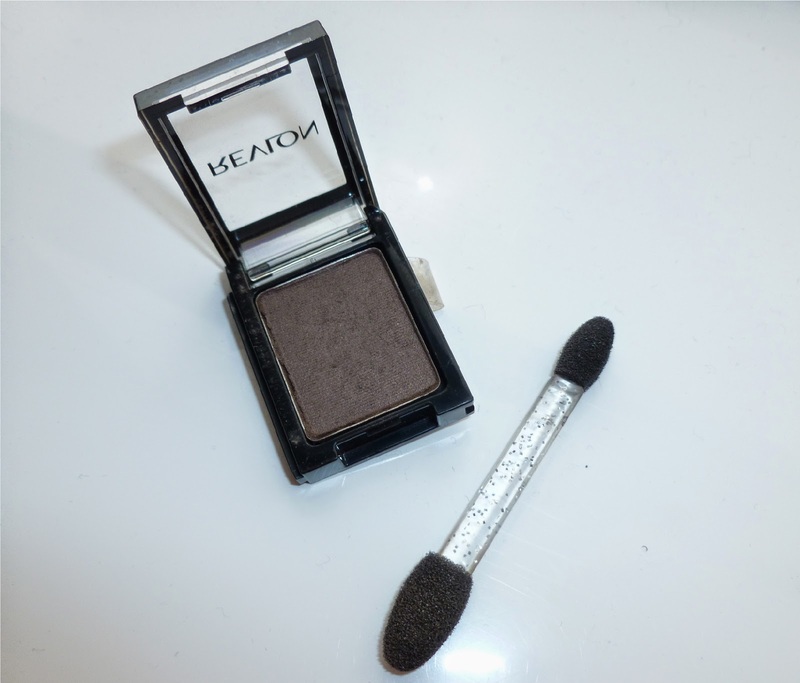 I came across Revlon's Colorstay Shadow links whilst looking for a shade that matched my natural eyebrow colour. I think these eye shadows are fantastic! If you buy a few of these compact shadows, they can all slide together to make a DIY eyeshadow palette which would be perfect for travelling. There is a substantial amount of product in one shadow too, so they will last a lot longer than pre-made palettes. I purchased a shadow in the shade 'Cocoa' which matches my natural eyebrow colour perfectly. I then apply the eyeshadow to any gaps in my brows with light strokes using the smaller end of an eyeshadow sponge. Using eyeshadow to fill in your brows is a quick and easy way to add definition without making them look unnatural like some eyebrow pencils do. In the above photo, I filled in the eyebrow on the left with shadow and the right eyebrow is left natural. 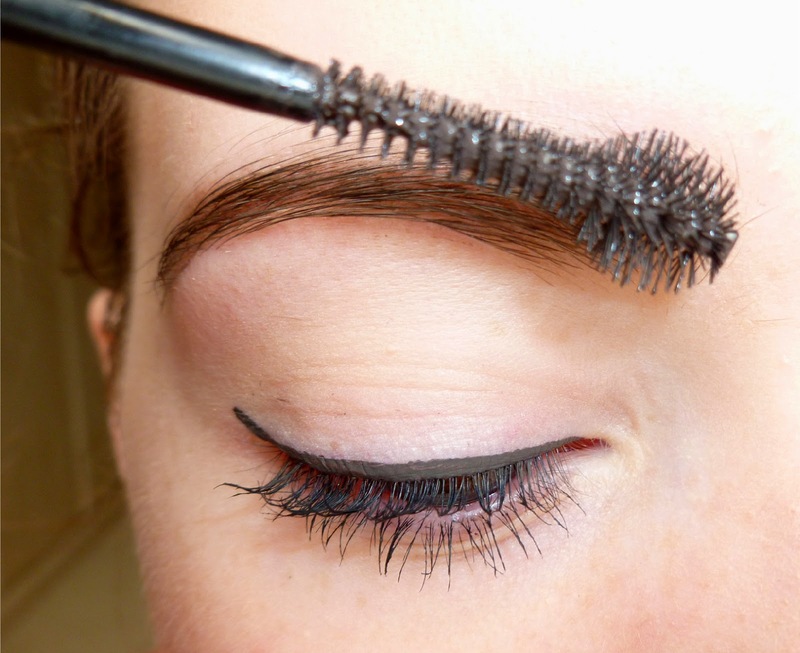 The left eyebrow looks a lot bolder which helps bring together the whole eye makeup look. Another important, and final step, when dealing with unruly eyebrows is to set them with an eyebrow gel. I picked up Maybelline's Browdrama in Dark brown and I'm actually pretty impressed with the product. I've seen a lot of beauty bloggers use Maybelline's Great Lash clear mascara to set their brows, but I wanted to purchase something with colour in case I was ever feeling lazy and wanted a quick way to both set my brows and add a bit of colour to them. If you have quite a few gaps in your eyebrows, I wouldn't recommend this product if you're looking for something that will help fill them in, it's more of a tint to add some oomph into fairer eyebrow colours and to set them in place. I finish off by lightly combing the fatter end of the brush through my eyebrows to set them in place. After applying this product, my eyebrows don't budge at all throughout the day. I hope this post was a little more thorough than my old eyebrow routine in my everyday eye makeup post. 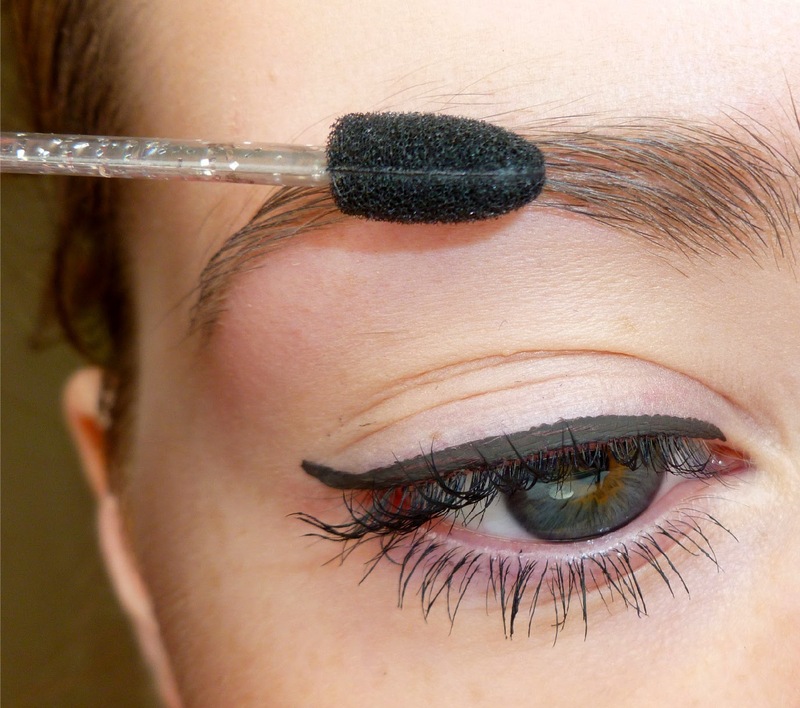 Do you think filling in your eyebrows is an vital step in your makeup routine? Let me know in the comments! 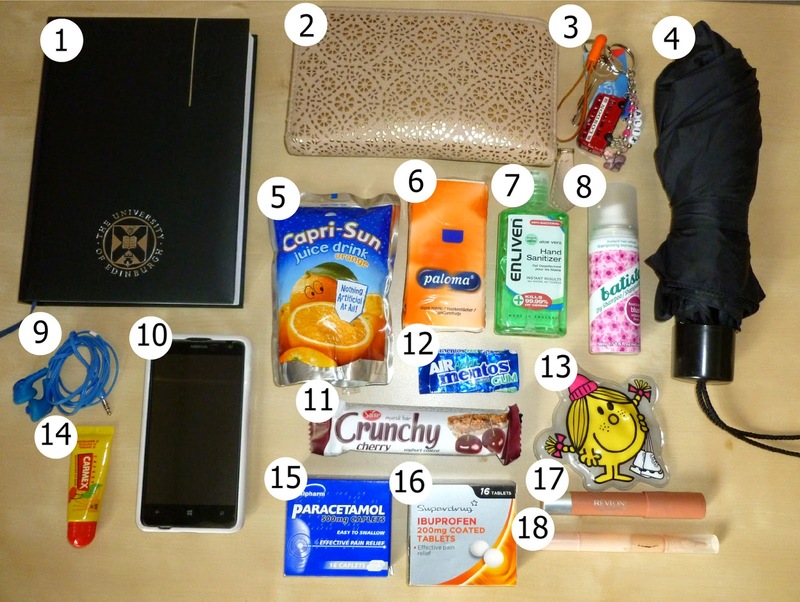 What's in my bag blog posts are my favourite type of posts to read, so I thought I'd show you what I carry in my everyday handbag. As mentioned in my previous blog post, I'm obsessed with everything Céline inspired and managed to grab a bag similar to the original Céline Mini Luggage tote bag for a huge fraction of the price on Ebay. 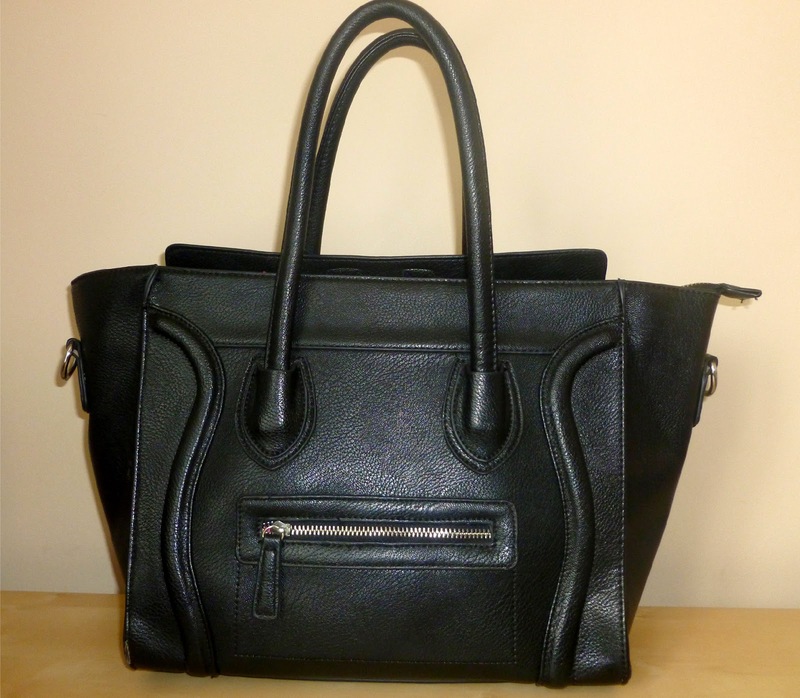 I got it as a gift and I believe it was £18.45- an absolute bargain for a 'designer inspired' bag without the logo! The bag itself is very sturdy and has lasted over year without any signs of wear and tear, despite being used almost every day! There is a main zip into the contents of the bag as well as two zip pockets and two more open pockets inside for valuables or smaller items. 1. Diary - I'm still trying to transition to writing down events in a diary rather than in my phone's calendar. I use my Uni diary mainly for assignment deadlines, but as Uni has finished for the Summer, I'm using the rest of it up for personal notes/calendar entries. 2. Purse - My purse is from New Look. This was featured in my high street haul post, which can be found HERE. 3. Keys - I have my house keys as well as a London bus and a personalised keyring I received as a gift for my 18th birthday. My Mum also makes me carry her Tesco club card on there in case I'm ever shopping. 4. Umbrella - I live in Scotland and the weather is very bi-polar, so an umbrella is essential. 5. Drink - I usually have a bottle of water in my bag, but today I have a capri-sun. 6. Tissues - Always useful. Recently had to use these to mop up my huge starbucks drink spillage in the University library *cringes*. 7. Hand Santiser - I think this is a cheap £1 bottle from a supermarket. 8. Dry shampoo - This is a mini 50ml Batiste bottle I use to give my hair a little more body throughout the day. 9. Earphones - I go through a lot of earphones, most of them tend to break in one ear after a while, so I buy cheap JVC Gumy ones on amazon. Essential for travelling! 10. Phone - I have a Nokia Lumia 625 and love it to pieces (apart from the Windows store at times, grr!). 11. Food - I always have something to snack on in my bag, today it's a cherry flavoured cereal bar. 12. Chewing Gum - I don't really have a favourite type of gum, I just pick up whatever's lying around the house. 13. Hand warmer - I picked up a pair of hand warmers from Boots for £1 in their clearance section a few weeks ago. It's activated by snapping a button inside the sachet and needs to be boiled in a pan of water in order to be re-heated again once it has cooled down. I find these are really handy when it's still a bit chilly outside! 14. Lip balm - My favourite lip balm is Cherry flavoured Carmex. 15+16. Painkillers - I carry ibuprofen and paracetamol just in case I get a headache or someone else isn't feeling well. 17. Lip product - I usually have the lip product I'm wearing that day in my bag. Today, I'm wearing Revlon's Colorburst matte balm in 230 Complex. 18. Concealer - I don't tend to need to touch up my makeup, but I always carry concealer in case I want to cover any blemishes that pop up during the day. 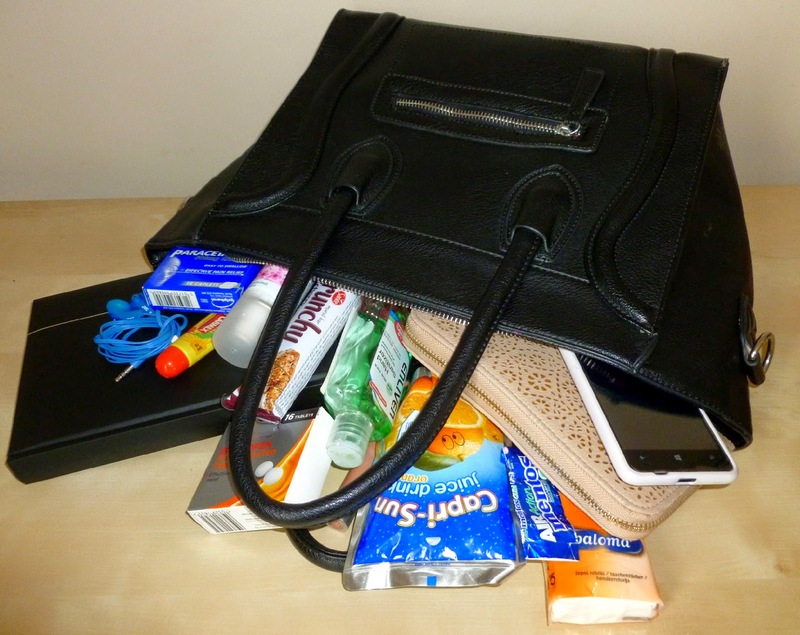 Let me know what you carry in your bag and if you would like to see another what's in my bag post for any other occasion! A couple of weeks ago, I went out for lunch with my work colleagues and threw this outfit together. I had no idea what to wear, so this was a very last minute outfit ensemble (so, apologies for the camera quality!). Despite being rushed, I actually quite liked how it turned out. 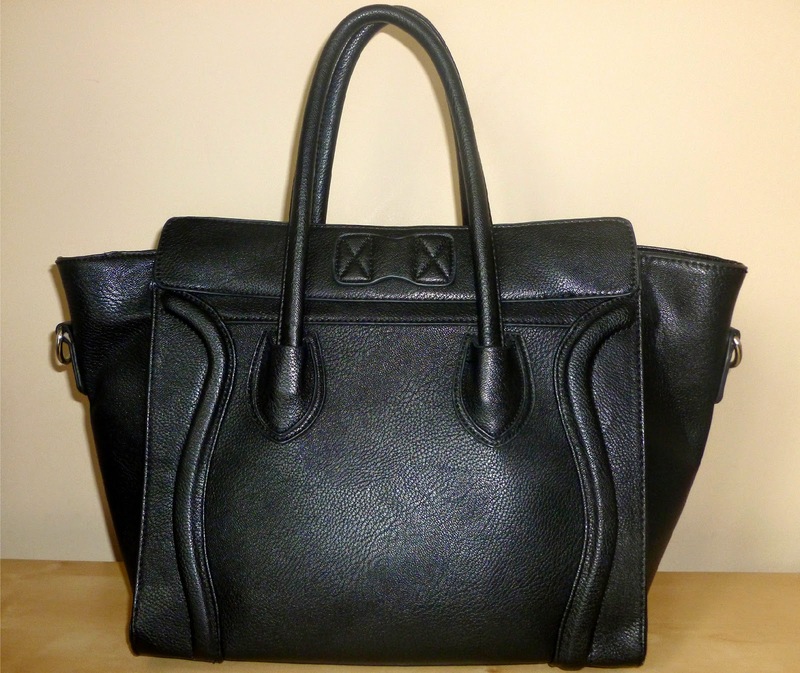 I don't own any authentic Céline pieces, but it's definitely a brand I'm wishing to purchase from one day. I've been obsessed with everything Céline 'inspired' recently and purchased both my T-shirt (£6) and handbag (£18.49) from Ebay. My Mum bought me the handbag as a post-exam present last year and it's still in great condition despite being inexpensive and loved to pieces! 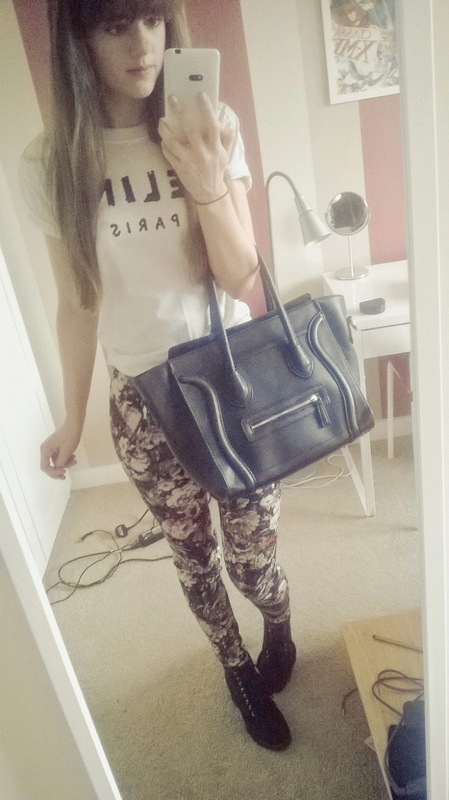 I paired the t-shirt and bag with my favourite printed trousers (as featured in my Club Night OOTD post) and some heeled black boots (as featured in my Winter Lookbook). Tell me some of your favourite designer brands you purchase from (or are on your wish list!) in the comments! It's been a while since I've made a blog post. Life has been pretty hectic lately, I had my final exams for Uni and the past 4 weeks have been full of 7am-5pm library shifts followed by evenings at my desk with my head in law books. 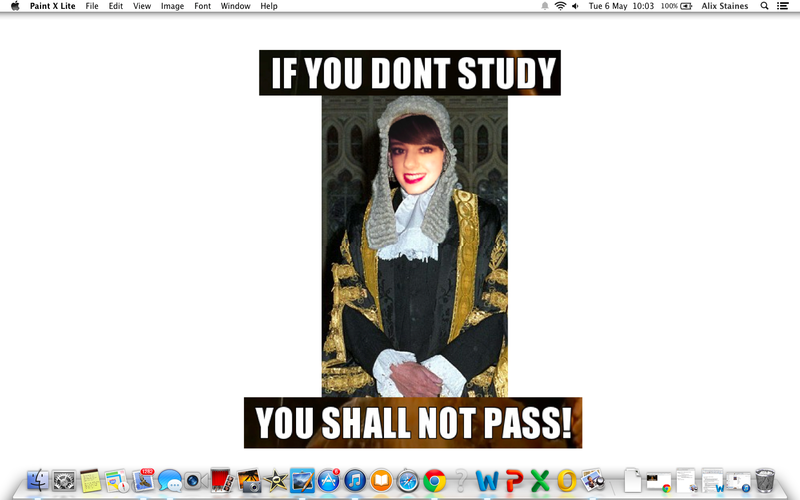 I did actually reach breaking point studying 24/7, my 'study breaks' resulted in photoshopping my face onto Lord Hoffman's and setting it as my desktop background for motivation. Best. Edit. Ever. Not exactly the most relaxing month I've had to be honest, but it's all over and I have lots of plans for my blog over the summer months! You may notice a few changes already... I've spent the whole weekend re-designing my blog and I'm pretty chuffed with how it looks at the moment. When I have blogging breaks, I tend to feel more confident returning to blogging again if my blog has had a fresh re-vamp. There's no promising it will stay this way, I'm always reading other blogs for inspiration and my HTML coding confidence is finally managing to improve! I also changed my blog URL. I used to be www.lets-kiss-and-make-up.blogspot.com, but now it's simply www.letskissandmakeup.co.uk! As far as plans for the summer, I'm going on holiday with my family as well as touring Belgium with my old high school's music department- so I'll definitely be documenting those trips. But apart from that, I have a LOT of spare time to blog, and I've made a list of blogs I'm planning on writing in the next few weeks. What are your plans for the summer? Are there any blog posts you would like to see in the future? 1. 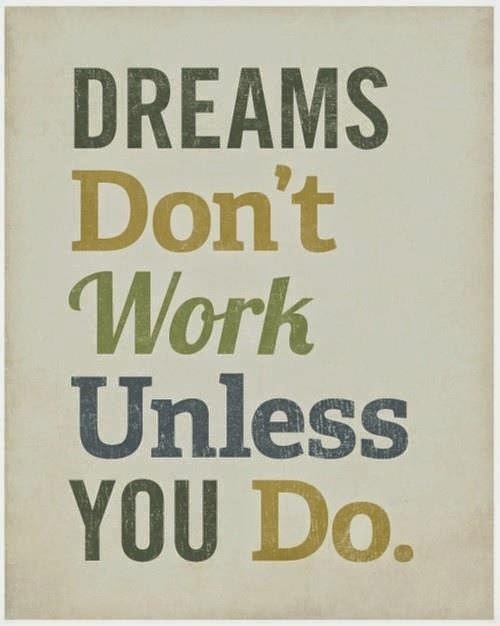 Plan your revision in advance and stick to it. As soon as exam leave starts, I'll make up a revision timetable splitting up my day into study sections. This involves deciding on subjects I'll revise during the morning/afternoon/evening and whether I'll be focusing on making notes or answering past paper questions. I find this helps to keep me on track with my revision as well as ensuring I go over everything I want to cover before the exam. 2. Find a time and place that allows you to study productively. I find I'm easily distracted if I revise in my bedroom, so I like to reserve my bedroom for relaxing in study breaks and study in the library instead. If there's not a library in your school, many public libraries have quiet study spaces. Different people study best at different times during the day. For me, I find I am more productive in the morning and in the evening so I will make plans in the afternoon - when I am less productive - to meet with a friend or go on a walk for an hour or so to restore for my next study session. 3. Study actively. There are lots of different ways to study: note-taking, group study, making posters and mind maps, answering questions and many more! I'm a visual learner, so I like to make diagrams and create posters. 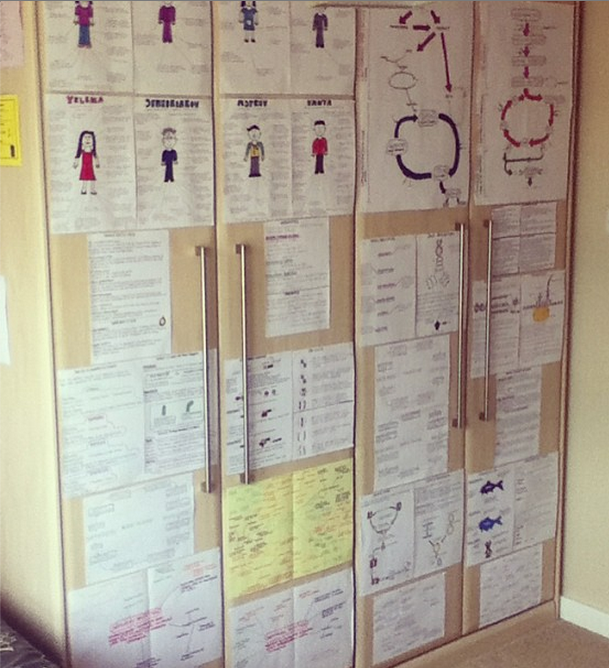 Below is an Instagram photo of my wardrobe last year during my school exams. I did things such as sketch out biology diagrams and draw pictures of what I thought the characters in my English books looked like and surrounded the drawing with character quotes for a more enjoyable way of remembering them. I've also found teaching others is a great way of making yourself confident with what you know. People learn best in different ways, so stick to what you find helps you best! 4. Take regular breaks from studying. You won't be able to remember everything you are studying if you are on a 6 hour study session without any breaks. Try to concentrate on a subject for an hour and give yourself a 10 minute break to grab a snack, scroll through Twitter or watch a YouTube video and then go back to studying. I like to study one subject in the morning and then switch to studying another subject in the afternoon, this way you're less likely to lose interest in what you're studying and make you remember more of what you have learned. 5. Vary your revision techniques. It's important to make sure you know everything you're supposed to for the exam, but don't forget to practice exam techniques too by trying some past papers. When I start to study, I focus on learning my notes and then attempt some past papers to apply my knowledge to a question I might possibly be asked in the exam. There is nothing worse than learning a whole course and being stumped in an exam because you haven't looked at an exam paper before! 6. Use different sources to add to your knowledge. Pre-written notes from your subject organiser are very helpful, but it's good to read other sources too. When I'm studying, I like to combine my lecture's pre-written notes as well as my own and from a textbook to make sure I have detailed notes and that I have covered everything that could possibly be asked in the exam. If you are younger, study guides are really helpful too. A lot of resources are available free online or in the library, but if you know of anyone older who has sat that exam in the past, ask if they would let you borrow some of their textbooks! 7. Make a list of enjoyable things to do after your exams are over. I know getting exams over and done with is in everyone's thoughts, so make yourself a list of exciting things you want to do after they have finished. 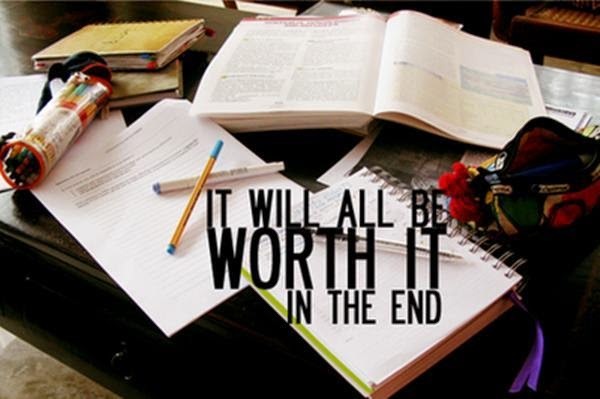 This will help motivate yourself to study so you can look forward to what's in the future. Things on my list include shopping for a new summer wardrobe and re-designing my blog. 8. It's OK to be stressed. Something I learned in my psychology classes in school is that you perform better being slightly stressed than not being stressed at all or being overly stressed. Stress is natural for everyone, especially when some exams can determine your future and everyone wants to do well. If you feel as though you are getting too stressed about exams, take a break from studying or talk to someone about it if you're concerned. 9. Keep yourself healthy. During exam time, it's easy to get caught up in studying and forget to look after yourself. It's important to eat healthily and drink lots of water to feed your brain. Things I like to snack on when studying include nuts, oatcakes and fruit. It's also important to give your brain a rest and get a reasonable amount of sleep to help your body restore itself for another day of studying. 10. Try to relax the night before the exam & be organised on the day of the exam. I tend to read over a few of my notes in bed after a bath and have an early night. You want to be on top form for the exam, so there's no use staying up late studying as you'll be exhausted and less alert in the exam the next again day. On the day of the exam, make sure you have a decent meal, get your essentials organised and get to the exam venue in plenty of time before it starts. I like to make sure I have a few extra pens with me as well as a bottle of water and some rescue remedy pastilles in case I get a little anxious before I go into the hall. Make sure you know your seat number (if you have one) and are familiar with all the rules during the exam including mobile phones and what to do if you're ill etc. Allow yourself a couple of minutes during the exam to carefully read each question and roughly create a written plan of notes for each of your paragraphs to keep you on track if your exam is essay based.